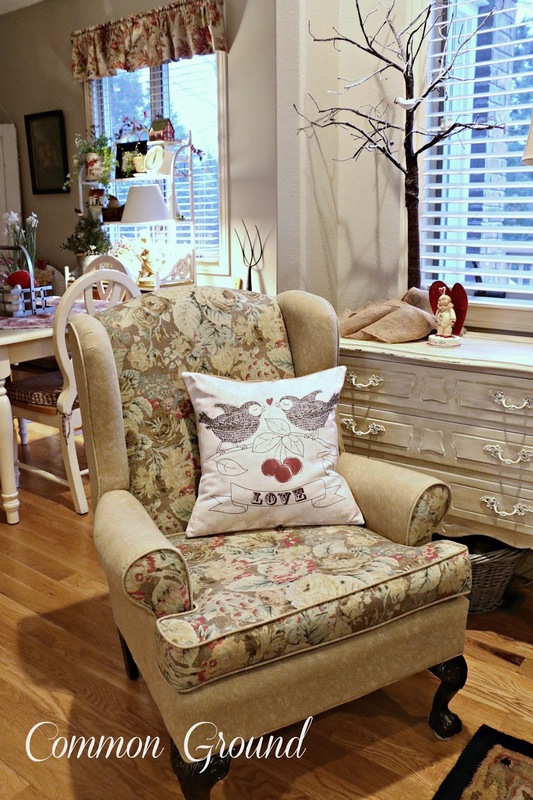 One of the easiest and fastest ways to decorate for any Season or Holiday is with throw pillows. Their seasonal colors and design bring instant "decor" into a room. See the little pillow below? I fell in love immediately. Those little love birds kissing, aaahhh...they're just the perfect Valentine's Day fun. You probably already have guessed by now that I'm a pillow-aholic, yes, I admit to my weakness. I have a storage room...filled with pillows. And I have no intention of giving up my obsession... shocking. I know there are many of you out there that suffer the same malady...we cannot help ourselves. Yay. we don't have to! Here are just a few to show you what's in store. So cute...I just want to squeeze them! I've had other Pin Your Pillow Give Aways, and you don't have to be on Pinterest to join in on the fun. There are several ways to enter for an 18x18 pillow cover. With your choice of backing in burlap, natural or black canvas, envelope closure. Go to Elliott-Heath Designs on Etsy and "Pin" 3 of your favorite Pillow Designs. Then leave a comment here on this blog. "Like" or have already, Elliott-Heath on Facebook. Then leave a separate comment letting me know. Or just let me know your 3 faves in a comment here on this blog. See, there's a way for everyone to Enter! I love pillows too. My favorites are the one with the arrows. the bunny and the love birds. I love your pillows and liked you on FB. Wow I love all your pillows. I pinned the French Honey Bee Hive, French Map and French Country Illustrated. Do you see a theme there. All are so lovely. Here's hoping I win that lovely pillow. Love all her pillows, oh, how to choose!! Love the big brown rabbit pillow, large red butterfly pillow and the faded American flag pillow. I love their pillows. I pinned 3 on Pinterest and I liked them on FB, Great contest thanks. I love these pillows. I pinned 3 on Pinterest. Thanks for the opportunity to win. What a decision! I loved them all, but I picked SP-82 Antique Easter Botanical, FR109 Easter Home Decor and SP140. These are just beautiful. I liked them on facebook already and still "like" them. I'd love to win. When you love pillows, it's so hard to choose just one or three! I adore the French Honey Bee, the Spring French Rabbit, and the Easter Pillow Flourish. And I think all 3 of those would be smashingly pretty together! Thanks for the chance, Debra, and I can imagine the fun you're having pulling all your things out in your new home! How to choose 3 favs!! I can't... but I do love the Home Decor Toss pillow, the Easter Home Decor pillow and the Valentine Dictionary pillow. Be blessed!! I 'liked' Elliott-Heath on Facebook. 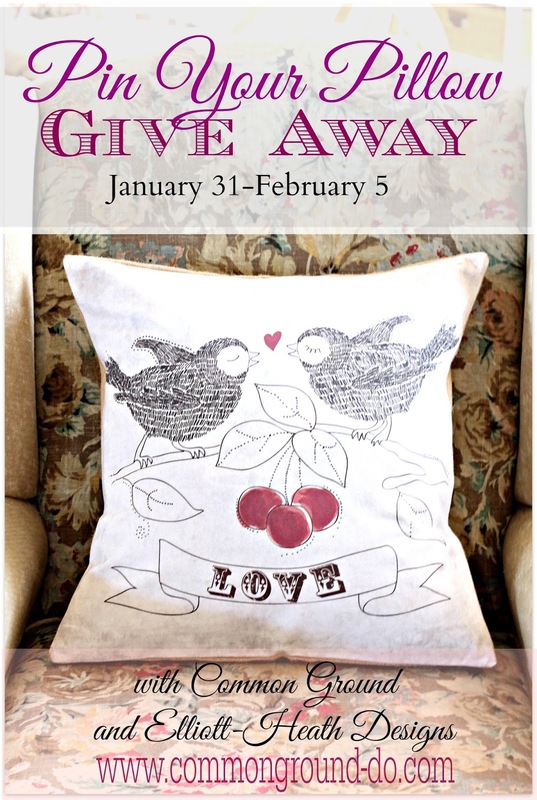 How exciting for the possibility to win one of these beautiful pillows! Love them all it was hard to pick but I did! All three are Valentine pillow, *love heart French style, *dictionary heart cat print, *home is where the heart is French style. Thanks for the opportunity! I also "liked" on Facebook! You're so right, Debra, these pillows are beautiful. I pinned three of the Spring French Floral Botanical pillows on pinterest...lovely! Thanks for all of your decorating delights! 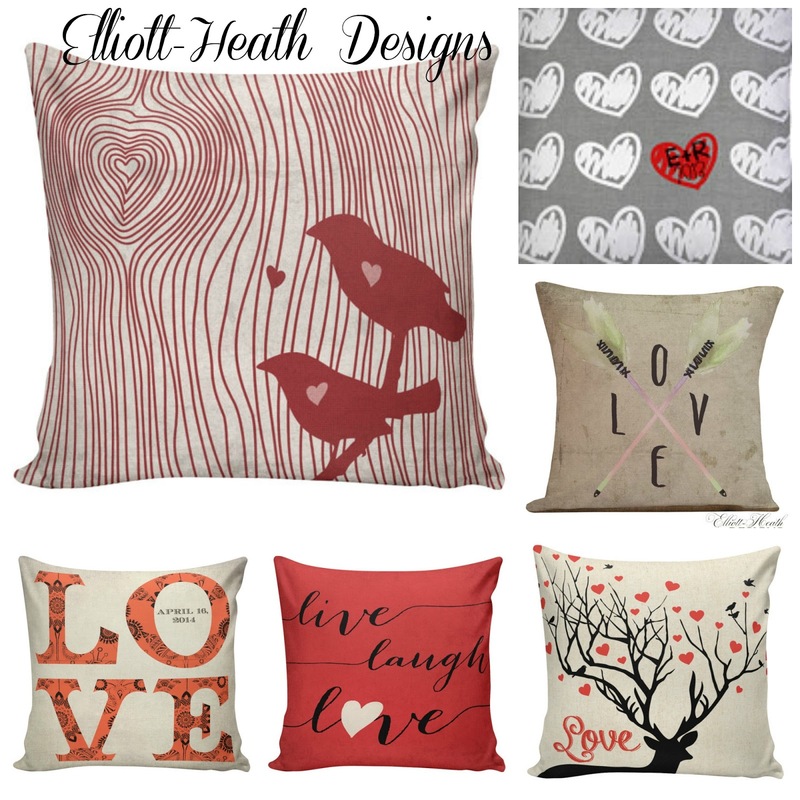 I "liked" Elliot - Heath Designs on FB because there was not a "love" button. Thanks for introducing me to her beautiful pillows!! Hi Debra, ...you didn't mention that she had so many beautiful designs! It was actually hard to narrow it down and I didn't make it to 3 but 4. So ..my favorite ones are ... FR42 ~ English Court Records, CH35 Vintage Santa, FR25 ~ English Royal Corronation Crown and last but not least ... FL11 ~ Union Jack. All of them were so lovely and thank you for the change to win one. I "liked" Elliott = Heath Designs on FB. Their pillows are lovely. What a wonderful assortment of pillows! Ones that especially caught my eye were the Halloween Pillow Vintage Jack-O'Lantern Postcard Pillow (how adorable is the expression on her face?! ), the Spring Rabbit pillow, and the Valentine's Xs and Os pillow - the one with initials in a heart at the bottom. But - I love them al! Beautiful pillows ! I have pinned my three favorites. Thank you for this lovely giveaway !! I "liked" the facebook page long ago, and still like ! :-) Thank you !! 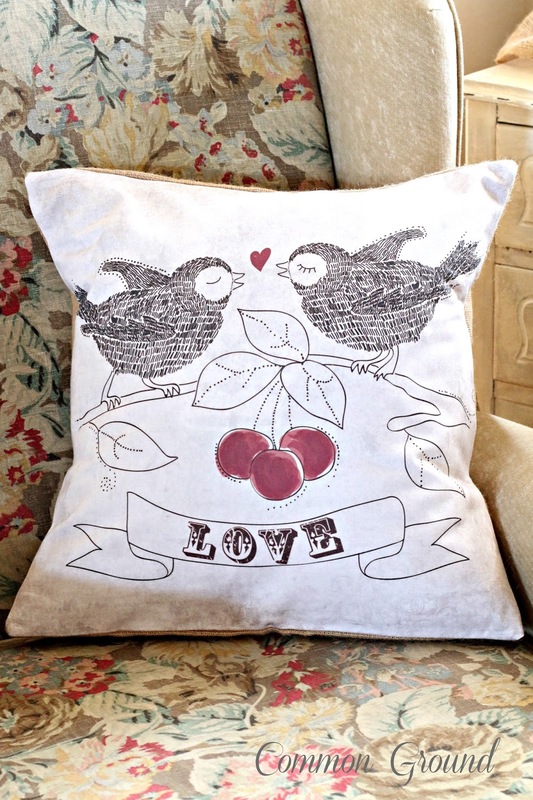 Love the "love birds" pillows, the botanical sunflower and the spring French bunny. Great designs and colors. I am afraid I will end up being a collector of Elliot Heath Designs too! Thanks for the chance. Oh how fun - I so loved them before and still love them now. Pinned 3 on my Pillow Board. So hard to choose! Their botanicals are beautiful and I have a soft spot for anything with cows or sunflowers! Thank you for this opportinity! Oh my goodness. I've pinned 3 + of these beautiful pillows to my Decor Pinterest board. Oh gosh...I LOVE their stuff! I picked several on etsy to pin--they even have a Poe pillow cover! If I had to choose, I would choose a nest or the hydrangea, although I also love the live, laugh, love. I have already liked them on FB, and I'm going to follow them on pinterest! What a wonderful giveaway! Thank you for hosting it!... It was hard to choose, but I've pinned my three favorites on my pillow board on Pinterest. My favorites are Paris French Country Illustrated Plate with Love Will Be Our Home Burlap Cotton Throw Pillow Cover FR-126, French Farmhouse Style Burlap Cotton Throw Pillow Cow Blue FR-85, and French Style Burlap Cotton Throw Pillow French Cow Blue FR-84. I love pillows. My husband says it takes twenty mins just to take them off the bed before crawling in. Love their pillows. I did favorite three but could of done so many more. Thanks for the chance. I like Elliott-Heath Designs on facebook. Thanks for the chance. Feeling quite bucolic today so have chosen my Pinterest selections from the Domestic and Farm group.--- too, too gorgeous! So many awesome pillows how on earth do you choose just three? Every time I hit the next button I was like "drool"!! Stand outs for me are Elliot Established 2015, Valentine Deer and Dictionary page cats. Some incredible covers in Halloween and Christmas! I just spent the last hour going through all 38 pages of E-H Designs list of pillows on Etsy - such amazing choices! I pinned at least a dozen choices, although my top 3 are the Vintage French Pink Invoice, the Vintage Paris Map Expo Fair 1900 and the Holiday Vintage Christmas Faith King of Kings. I liked them on Facebook and added quite a few picks to my Beautiful Pillows Pinterest Board! I really enjoy your style! Thank you for this great giveaway! I follow Elliott-Heath on Facebook. Simply adorable pillows. I pinned three favorites of my own, One little Paris number, one with a cow and one with deer! They are so so cute!Cute! Cute! Such fun and inspiration to be found with all those pillow covers! Picked a vintage tree, vintage spring honey bee, and harvest fall sunflower. Your new place is looking great ,it is inspirational too! They do have the prettiest pillows! I already like EHD on Facebook. Oh gosh that French red cow is gorgeous! Also the French bunny, rose postcard, the French encyclopedia is awesome too! Beautiful designs! I would love to win! I pinned three on Pinterest! They have the prettiest pillows! 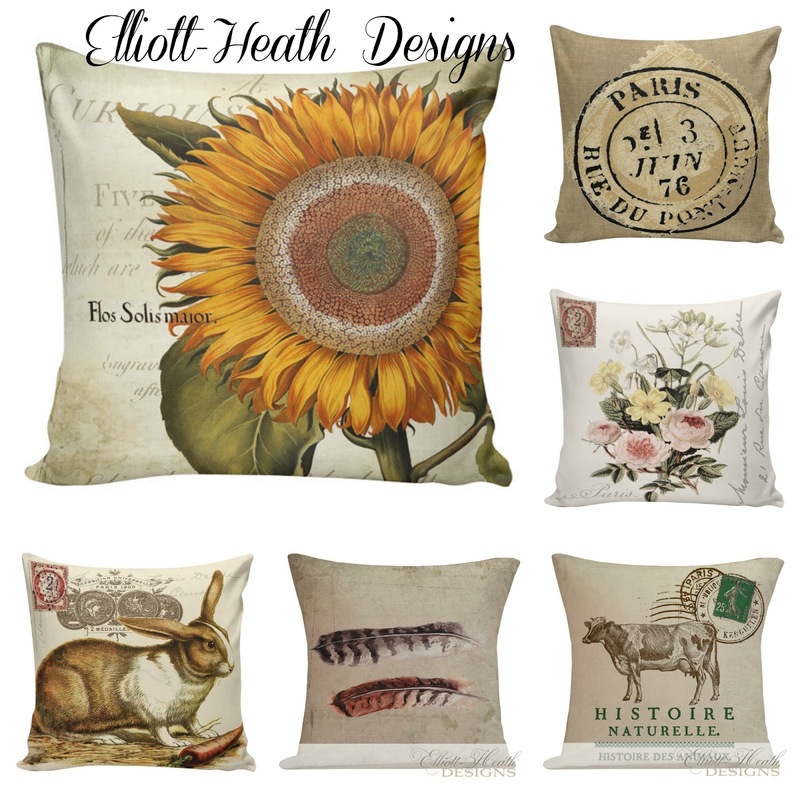 Love the harvest fall sunflowers, the pretty Easter pillow and the vintage spring honey bee. There are so many and so hard to choose; I love them all. I would love to win. Oh my, so many beautiful pillows! My absolute favorite is "Be Brave Little One" because that is my husband's nickname for our 14 year old daughter. Then the St. Patrick's Day, and Vintage Thanksgiving with the turkey. Where have you been all my blog life? lol! I'm also Elliot-Heath's newest fan on the FB!